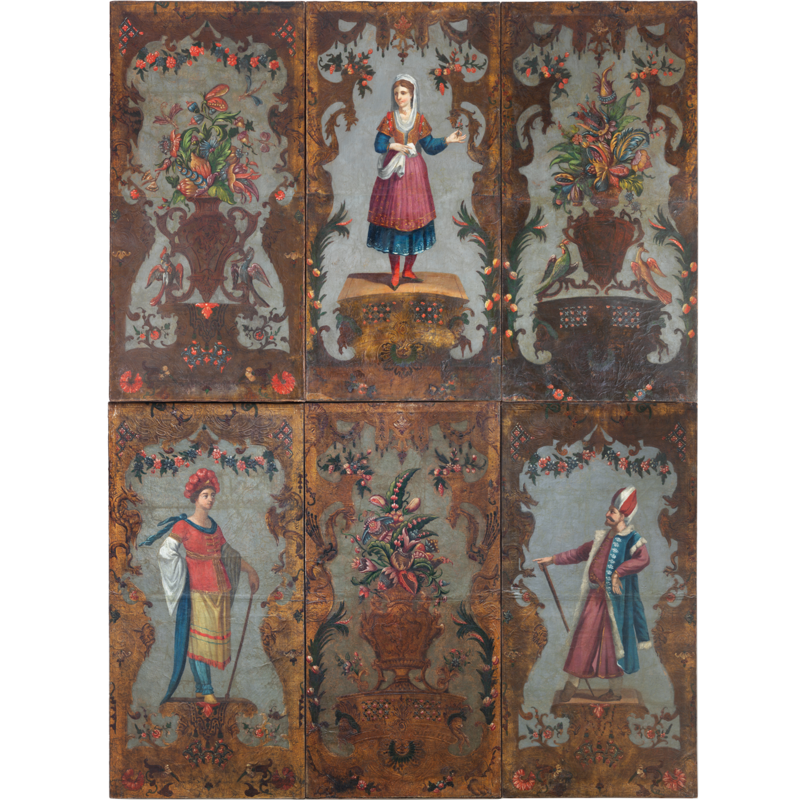 Gilt leather wall hangings were very popular in Europe in the 15th to 18th centuries. They graced the walls of stately townhouses or castles or decorated altars. This technique has its origins in the Middle East and North Africa. It blossomed into fine craftsmanship, which spread from Spain via Italy and the Netherlands to Germany, England and France. Leaf silver was glued to tanned leather, which was next covered with gold paint and polished. What appears to be gold is, in fact, silver. The different patterns and ornaments were imprinted with wooden forms and embossed with hallmarks. In the next step, it was painted using floral or figurative motifs to add colour and bring it to life. Lastly, the leather panels were stretched onto wooden frames, which were easier to attach to walls. This led to the creation of large panels for the stately salons of the era. This panel has been restored and it is in a good condition. It consists of six parts, three with floral and three with figural motifs in the centre. The figures appear to be dressed in a Turkish, Italian and German style, which is typical for Raymond Boissier's workshop (see "Goldrausch - Die Pracht der Goldledertapeten" – “Gold Fever: the Magnificence of Gold Leather Wallpaper” – by Sabine Thümmler and Caroline Ewa Gerner, Hirmer Verlag Munich) and are captured in poses that are reminiscent of dancers or theatre performers. The German Wallpaper Museum in Kassel also shows items from this collection of wall hangings from the Boissier workshop.